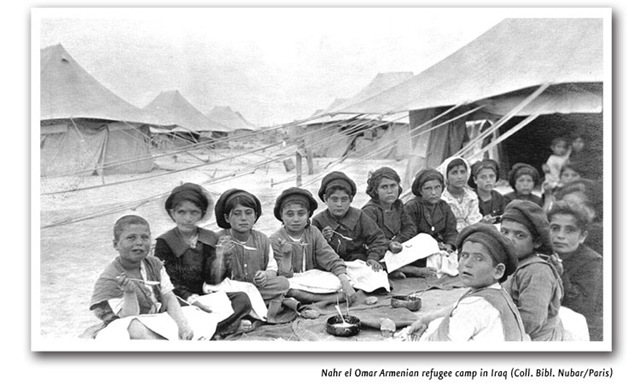 Recently, AGBU has made available a selection of rare Armenian Genocide-era photographs from the world-renowned AGBU Nubarian Library of Paris on the organization’s newly launched flickr page (flickr.com/agbu). Over time more and more images will be added to this accessible archive and we hope that everyone will feel welcome to tag, email, blog and comment on these priceless windows into our history. Established by AGBU founder Boghos Nubar in 1928, the AGBU Nubarian Library has an extensive collection of 10,000 photographs, 1,000 periodicals from the 19th & 20th centuries, 40,000 books on Armenian history and over 500,000 documents that offer insight into the modern history of the Armenian people. The library is open to international researchers and journalists interested in learning more about AGBU and Armenian history during the 20th Century. It is an important resource that will ensure that we don’t forget. AGBU is pleased to announce the new AGBU Summer Study in Armenia Program that will launch its first season this summer 2008. In collaboration with the American University of Armenia (AUA), AGBU Summer Study is a unique four-week program that allows students to take up to two 4-credit courses at top universities in Armenia—credits are transferable to U.S. and other academic institutions. Participants will also participate in a cultural enrichment program that will expose them to the wonders of Armenia and its people. These courses, conducted in the English language, are designed to offer students an in-depth knowledge of topics in a variety of academic disciplines placed in a regional context to help participants gain a new perspective on Armenia. Choose from courses in human rights, regime development, Armenian art, healthcare in transforming economies, web applications and more, all taught by distinguished AUA faculty. This program is designed for students of Armenian descent eager to meet fellow Armenians from around the world and enrich their lives with a once-in-a-lifetime opportunity. For more information, email sap@agbu.org, or call us at +1.212.319.6383. To download an application form, visit www.agbu.org or click here. Professionals of Northern California for years. screening of several Pixar movie clips. AGBU Nork Children’s Center, who came to perform in Northern California. helping us learn,” Cherekdjian says. games, field trips, and pen pal communication with children in Armenia. The Kids Club’s next monthly meeting will be held on April 26 at St.
On the evening of January 21, 2008, Thomas Nader, Austrian Ambassador to Egypt, organized a dinner-reception in his Cairo home, which served as the occasion to bestow upon Austria’s Consul General Astrid Alexanian-Papazian the “Gold Medal of Honor for Devotion and Services to the Republic of Austria.” Present were high-ranking guests, members of Alexanian-Papazian’s family and a host of close friends. 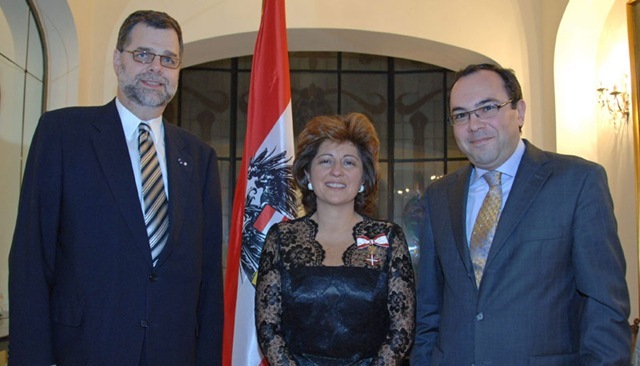 Ambassador Nader stated that the Alexanian family has represented Austria in a fitting manner and emphasized that all the ambassadors and their colleagues that have worked in Cairo have been greatly impressed with Astrid Alexanian-Papazian and the work she has done. He concluded his remarks, saying that having Alexanian-Papazian as Austria’s representative is an honor and that she is justly deserving of this medal. On behalf of Austria’s Ministry of Foreign Affairs, ambassadors, ministers and provincial officials, the ambassador extended the warmest congratulations and wishes. In response to the ambassador’s remarks, the lady of honor thanked everyone for their warm words of appreciation and kind statements. Alexanian was nominated Honorary Consul of Austria in Alexandria in 1987 and Honorary Consul General in 2004, in charge of Austrian Commercial and Cultural Affairs. She is currently President of A. Alexanian Group of Companies in the tobacco industry and is a member of the board and shareholder of the Egyptian Textile Industries SAE. She has been a member of AGBU for the past 49 years, is president of the Armenian Cultural Center Dikran Yergat since 2004 and has been involved in various Armenian community services. Recently, she was named to the Board of Directors of AGBU Europe.